Weathermoji is the perfect balance between weather icon set and emoji icons. 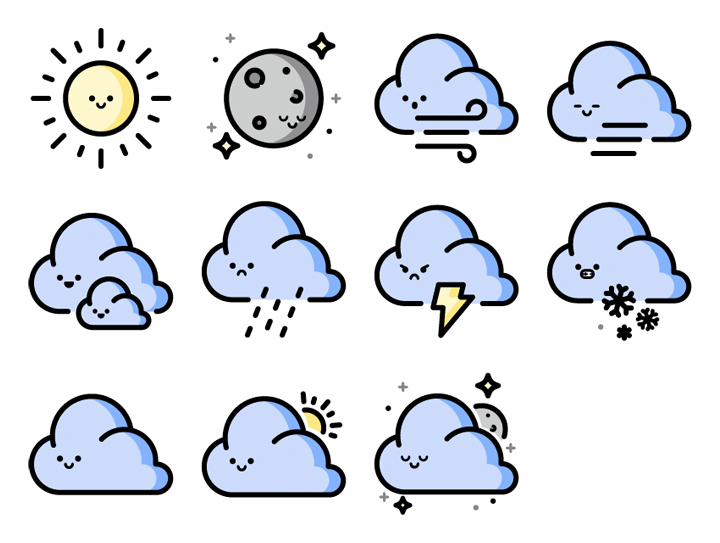 I wanted to set out to create a fun yet functional set of icons to represent different weather conditions. There’s no shortage of weather icons, so I had to ask myself how mine were going to differ from the rest. While finishing the design of each icon in Illustrator, I added a small face to the sun icon as it had looked plainer than the others. This subsequently created an imbalance in the other icons and I decided to try giving them each a facial expression that corresponded to the weather condition they represent. In the end I achieved my goal of creating something fun and unique while also remaining functional for its intended purpose.